Henry Clews was born in the United States on 14th August, 1834. He became a clerk in an import house but by 1860 was the owner of Livermore, Clews & Mason, an investment company in Wall Street. During the American Civil War Clews helped the government to sell bonds to finance its increased spending. When Ulysses Grant (1869-1877) was president, Clews provided him with business and economic advice. Clews held conservative economic views and was a strong opponent of the trade union movement. 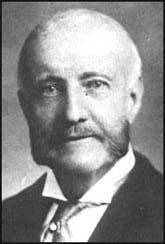 Henry Clews died on 31st January, 1923. The Knights of Labor have undertaken to test, upon a large scale, the application of compulsion as a means of enforcing their demands. The point to be determined is whether capital or labor shall, in future, determine the terms upon which the invested resources of the nation are to be employed. The labor disease must soon end one way or another. The demands of the Knights of Labor and their sympathizers, whether openly expressed or temporarily concealed, are so utterly revolutionary of the inalienable rights of the citizen and so completely subversive of social order that the whole community has come to a firm conclusion that these pretensions must be resisted to the last extremity of endurance and authority. The laboring man in this bounteous and hospitable country has no ground for complaint. Elsewhere he is a creature of circumstance, which is that of abject depression. Under the government of this nation, the effort is to elevate the standard of the human race and not to degrade it. In all other nations it is the reverse. What, therefore, has the laborer to complain of in America? By inciting strikes and encouraging discontent, he stands in the way of the elevation of his race and of mankind. The tide of emigration to this country, to this country, now so large, makes peaceful strikes perfectly harmless in themselves, because the places of those who vacate good situations are easily filled by the newcomers. When disturbances occur under the cloak of strikes, it is a different matter, as law and order are then set in defiance.